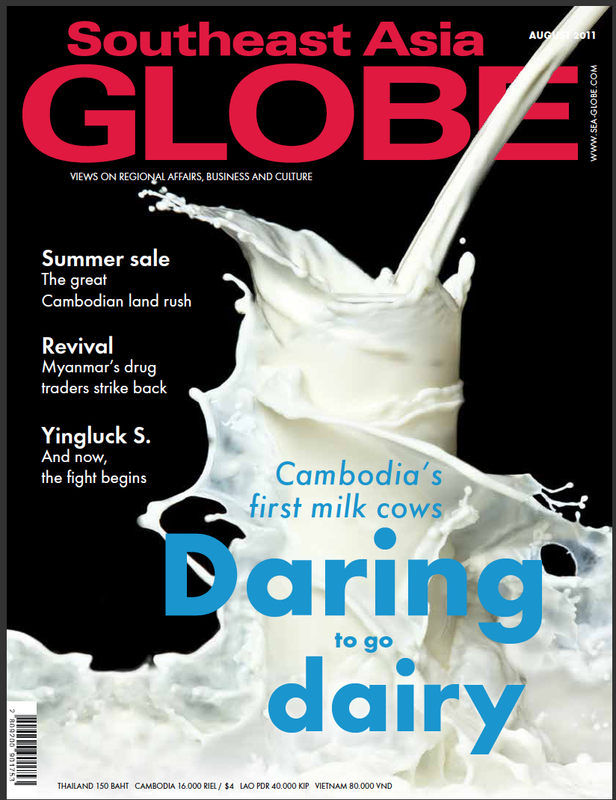 Cambodia’s dairy pioneers believe a massage parlour, piano music and fresh servings of tapioca are key ingredients in making premium cow’s milk. and mixing old-fashioned techniques with state-of-the-art technology – and a lot of initiative – to jumpstart the nascent industry. deal between Cambodia’s Mong Reththy Group (MRG) and Lordswood Farms Ltd, a British farming company, in 2009. 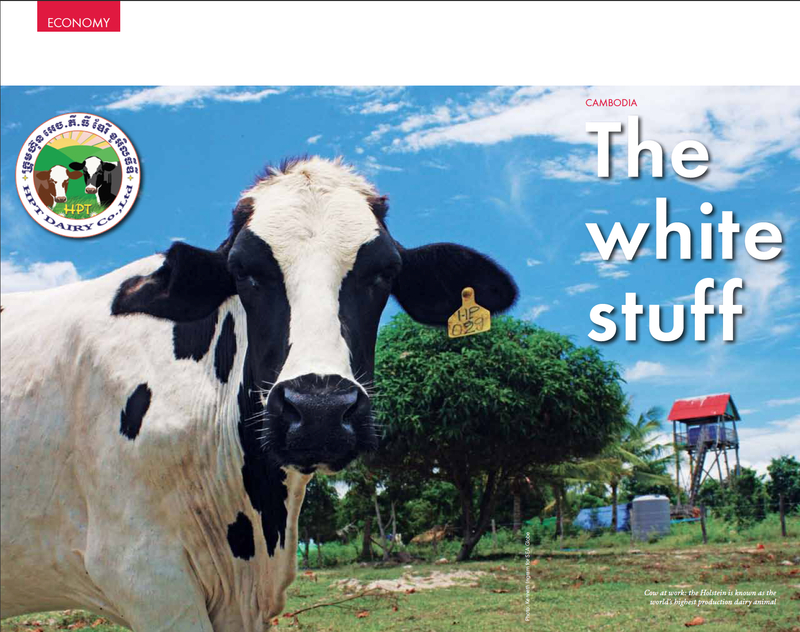 The $27m joint venture would have been the first to establish a commercial dairy farm in Preah Sihanouk on a 200-hectare piece of land, but it failed because investors felt there was a lack of regional expertise, said an MRG employee who asked not to be named. 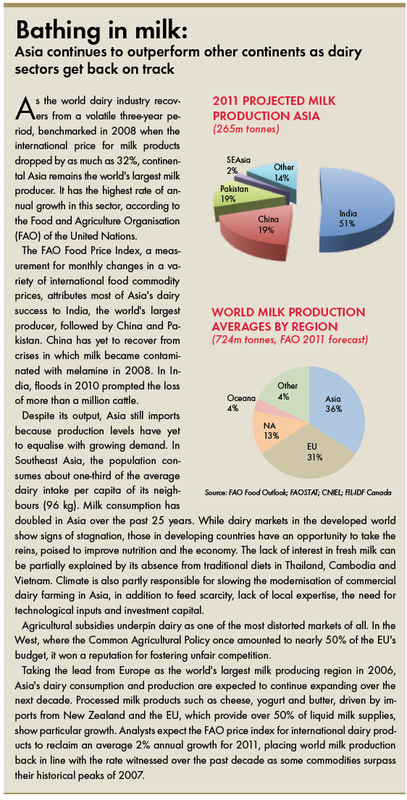 overseas training and an influx of technological remedies may, however, even the odds, and industries in neighbouring Thailand and Vietnam serve as powerful examples for dairy potential. The new farm near Kirirom National Park, about 90km from Phnom Penh, welcomed 40 Holstein in January from Australia, which has existing business and import ties with Cambodia. The stock was long-awaited, spending a month in Thai quarantine before being trucked across the border. Two of the heifers have since died, the probable result of transportation and stress, according to the farmers, but the next shipment of cows is expected this month. Between 80 and 100 heads of cattle will boost the current herd of 50, which includes 35 viable mothers. A stable supply of feed for the animals is one of the farm’s top priorities. Many of the crops used for silage are being cultivated by hand because they are relatively small-scale. Roughly 10% of the farm is dedicated to cultivating King Napier grass brought in from Thailand, while smaller plots are beginning to yield corn, soybean and cassava, the latter a key ingredient in tapioca. In addition to maintaining the cattle’s health, a process overseen by a single trained veterinarian at present, the farm’s infrastructure is also a work in progress. The cow barn, four months in construction, will eventually house 500 cattle as the herd is beefed up by both imports and artificial insemination. The barn will also be equipped with 24 industrial-sized fans, installed at distances of 12 metres apart in order to keep the cattle cool. “If the dairy cow is stressed, milk production slows,” says Chheang Bony, explaining the principles of the dairy industry. smart and they come by themselves when it rains,” says Kong Saroth, manager for agriculture on the farm, pointing to 10-metre by five-metre concrete slabs. There are also plans to introduce an automated machine that massages the cows, designed to reduce stress and improve their circulation. Chheang Bony is fascinated by state-of-the-art farming techniques used overseas, where Friesians aren’t the only black and white fixtures. “Research shows that cows who listen to piano music produce more milk,” he explains enthusiastically. is slated to start. The original plan had been to hit the market by November 2011, but that was delayed due to complications with importing machinery and equipment. “There are many steps to do in this business before success. It is a long-term business. 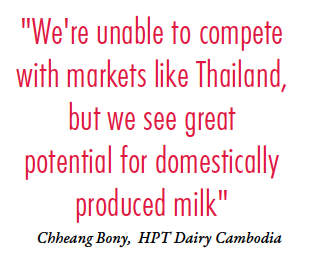 We will try our best… and we will see the full benefits from our dairy cows when they increase to 1,000 heads,” says Chheang Bony – an ambition he hopes to have realised by 2015. Importing represents one of the highest costs of the operation, which increases the pressure to master the art of artificial insemination. Trained in Thailand, the farmers use artificial insemination techniques each day with the objective of producing a larger Holstein workforce while lowering overheads. Nine months and 10 days in the making, a 45-55kg calf is considered a prized commodity. Because the enterprise lack the ultrasound technology employed on farms in developed countries, birthing can be tricky here and successful delivery hinges on the unborn calf ‘s orientation. tonnes per day as a reference point.